FlameShield™ high temperature, heat resistant and chemical resistant fabric offers the advantage of a non-asbestos material with a higher temperature range and with excellent resistance to almost all solvents, caustics and acids. 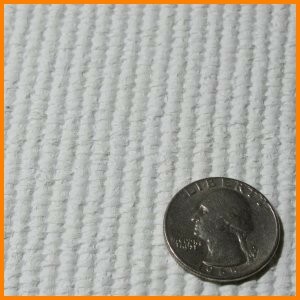 This fabric makes an excellent gasket material and is a milk white color. Available in 5 weights / thicknesses, in roll widths of 40" and 60", and in roll lengths of 50 yards - or 25 yards for heavier items.